A while ago I got a tweet out of the blue from Drew Buddie, @digitalmaverick. 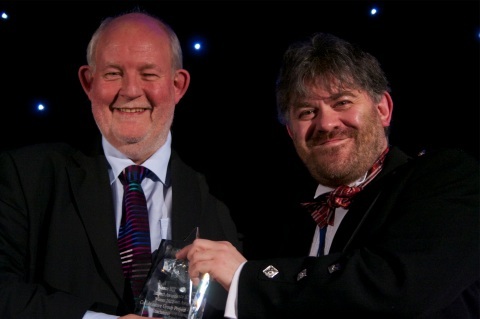 He had proposed TeachMeet for a Naace ICT Impact awards. As Drew is part of naace he though it better that someone else should represent TeachMeet. As I’ve been hanging round TeachMeet since the start he asked me if I’d like to do it. I was of course honoured. At some point I had to write a wee bit about TM to support Drew’s bid. TeachMeet was been shortlisted for a Naace ICT Impact Awards. This was in the Collaborative group project, In recognition of the way TM is a radical form of CPD and is transformative. I got an invite to the Naace awards, but given distance, work etc I could not make. I did watch twitter on Friday night. The 1000s of winners is the main point, the power of TM has proved, in opinion, not to have been the individuals who started driving it, the ones who have picked up the baton and seem to lead now but to be the crowd. In one way I was really disappointed not to be at the awards, but that is not the point. Drew picked up the award (nice tie) but there were 1000s of winners. anyone could have knocked up a video or turned up and picked up the award, better by far is walking into a buzzing room, seeing old pals, new folk grabbing a beer and waiting to be “learn something new, be amazed, amused and enthused”. I and many others have blogged about concerns over Future of TeachMeet. I remember being part of one 5 hour twitter marathon, which mostly proved twitter is not a medium for debate I’ve also been part of several attempts to straighten out TeachMeet, reorganise the wiki and even to protect the brand. I don’t think any of this did any good, organising TeachMeets is like herding cats, fun but pointless. At the moment TeachMeets is serving several different purposes. It will continue to do so. For me the goodness of TeachMeet is the serendipity, disruption and sense of subversion. This might not last, sometimes TeachMeets seem over organised, over sponsored sometimes they hit the spot, your milage may vary. Well worth joining in and having fun.